Origin and Habitat: Garden origin (Nursery produced cultivar perhaps of hybrid derivation). 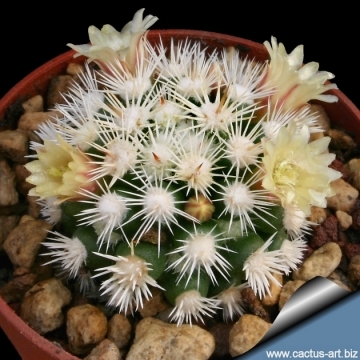 It's a variant of Mammillaria gracilis and it is supposed that the cultivars name indicate where it comes from. Mammillaria gracilis f. monstruosa hort. Nova Acta Phys.-Med. Acad. Caes. Leop.-Carol. Nat. Cur. 16(1): 338, t. 24. 1832 Hort. Reg. Monac. 128. 1829, nom. nud. 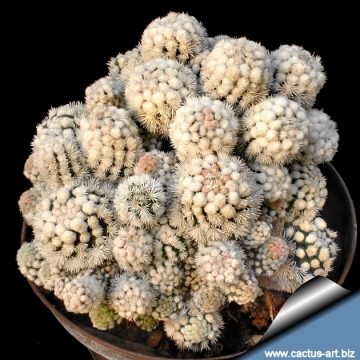 Description: Mammillaria "Arizona Snowcap" is a monstrous form of Mammillaria vetula ssp. gracilis which is characterised by densely packed separate clusters of spines. It looks so different to the wild species that it isn’t easy to realise that they are related. This cultivar offsets generously from sides and upper part of plant, which gives it a snowball appearance. Mature group can reach 10-12 cm in diameter and 6-8 (10) cm in height. Stem: Dark green almost concealed by the spines. Shortly cylindrical, to 8 cm long, 1 - 3 cm in diameter and branching profusely by sides, the offsets easily detaches. 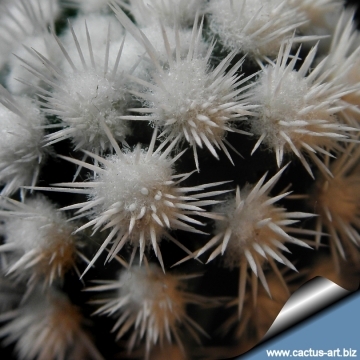 Spines: Short, white, thick and more densely packaged than its close relativeMammillaria gracilisis. Flowers: Small, about 12 mm long and in diameter, cream-yellow with pinkish o brownish midstripe in early spring. Mammillaria vetula Mart. : (Subsp. vetula) has 1-2 central spines, at least 25 radials, and flowers to 15 mm or more long. Distribution: Hidalgo, Guanajuato, and Queretaro at high elevations. 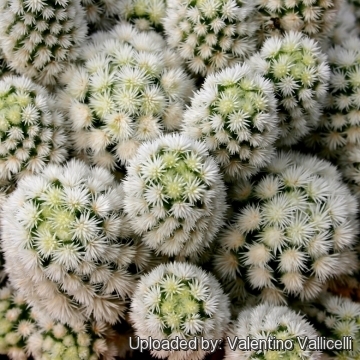 Mammillaria vetula subs. gracilis (Pfeiff.) D.R.Hunt: often lacks central spines, has only 11-16 radials, and flowers to only 12 mm long. Distribution: Hidalgo and Queretaro. 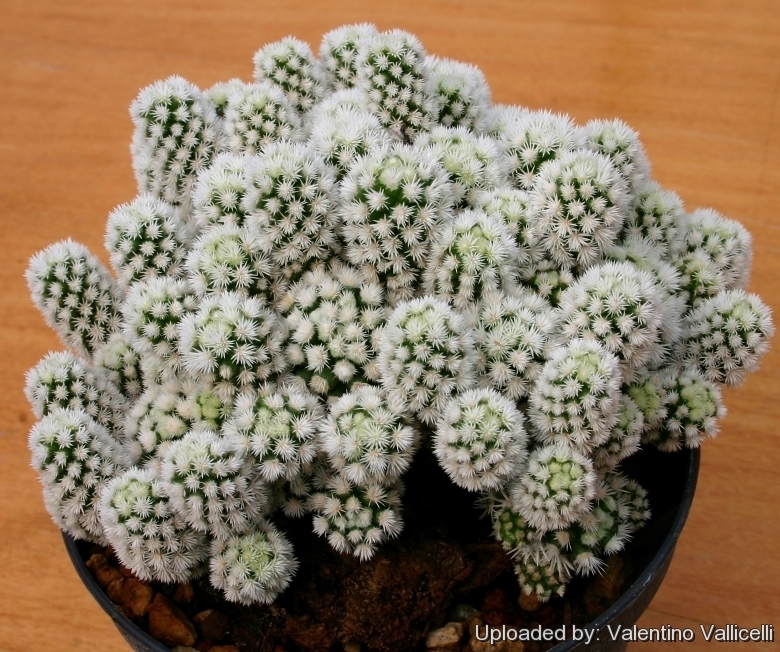 Mammillaria vetula subs. gracilis cv. Arizona Snowcap: Very pretty mutation with shorter thicker white spines. It offsets generously from sides and upper part of plant, which gives it a snowball appearance. 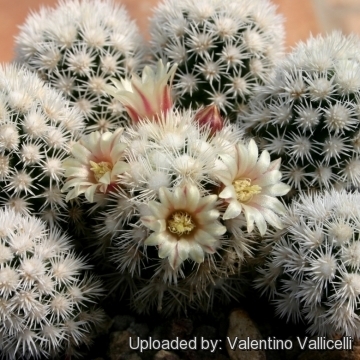 Mammillaria vetula subs. gracilis cv. 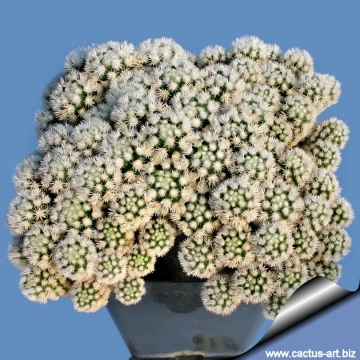 Clone A: Similar to "Arizona Snowcap" but with with coloured spines and bright pink blooms. Notes: Today this cultivar is very common, but rarely it is cultivated in the appropriate way (full sun). But the specimens correctly cultivated are really admirable. In the photo is shown a compact plant densely covered by candid spines . A true beauty!!! Cultivation and Propagation: Readily forms many offsets from sides and top. It does best in a mineral soil, good drainage is essential. Water sparingly during the summer months and keep dry in winter. It is a slow growing plant and once established, it will be content in its position and with its soil for years. 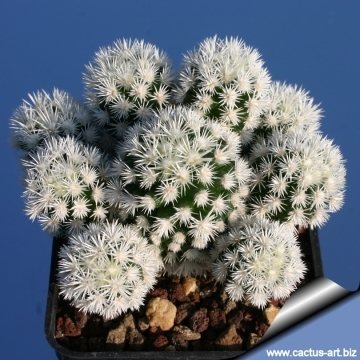 Extremely hardy, can tolerate full sun, long periods of dryness and light frost (-4° C). 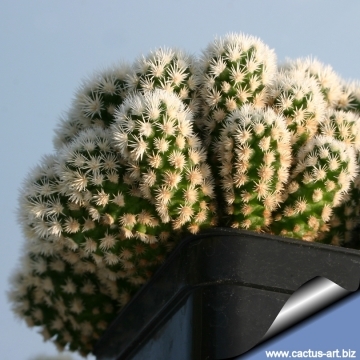 It can also grows in moderate shade, and a plant that has been growing in shade should be slowly hardened off before placing it in full sun as the plant will be severely scorched if moved too suddenly from shade into sun. Propagation: It is propagated exclusively from cutting during spring or summer.